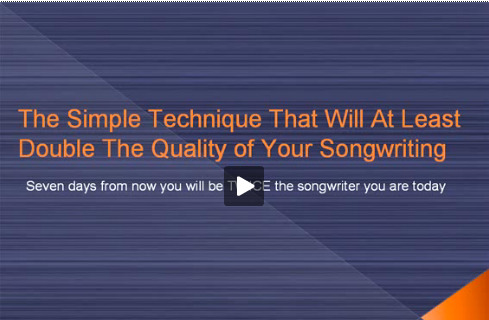 To view the video version of How To Write A Melody That Dazzles Your Listeners click here. This technique shows you how to write a melody that's absolutely irresistible. I want to start this one with a question. Have you ever had an experience when you’ve been doing something completely unrelated to music and then all of a sudden a really irresistible melody just popped into your head? Well this third technique is all about capturing these ideas. What this requires is having a portable recording device on you at all times and when an idea comes into your head you can document this by recording it into your recording device. Now I’ve actually recently purchased an iPhone, yes I am one of those geeky people that find that type of stuff really amazing! When I got the iPhone I found an application where you can record yourself speaking and then it will actually email that recording to your email address. So I use my iPhone to record melody ideas that come to me through the day. I recommend getting hold of some type of recording device that you can carry around with you all the time. And whenever a musical idea comes to you, use this device to capture the idea. Also, don’t wait for amazing ideas to come to you… record ANY IDEA AT ALL that enters into your awareness. The reason for this is, as you document ideas whenever you notice them, you’re reinforcing the behavior of having ideas. And because of this, you’ll continue to get more and better ideas. (This is a basic principle of psychology – you get more of what you reinforce). So if any idea occurs to you… even if you think it’s TERRIBLE – record it to your device. You’ll find that as you do this, the quality of your ideas will spiral upwards at lightning pace. Another thing that I recommend you do is when an idea comes to you, record it and also mention what your situation was at the time. This includes what the surroundings are, where you are, what time of day it is, and anything else you can of about your situation. The reason I recommend this is because if you keep a record of this you’re going to begin to see a pattern of when you’re at your most creative. This is extremely valuable because you can then put yourself in this situation more often and come up with more ideas this way. Let me give you a few examples to clarify this. So keep a record of this and identify the times when you’re at your most creative and then put yourself in this situation as much as you possibly can. Two tips that will make these three techniques even more powerful. The first how to write a melody tip is to set up your environment so it has a really nice creative feel to it. This can be anything from having candles, using dim lighting, having plants and hanging pictures on the wall. Anything you can do to give the room a really nice creative feel is going to help. The next tip is to focus on getting emotion flowing through your body before you begin to create. The way to do this is to use past memories that really have emotional significance to you. Maybe a past relationship or even create a completely new fantasy and attach emotion to it. Think about this event… visualize it… have it in your mind and keep doing this until you actually start feeling the emotion of the situation. Only when you reach this point, begin to create. You’ll find that when you do this your session will end up being FAR more emotional and creative. Also, the more emotional the session is the more it has this ability to tell a story even when there’s no words involved. This “storytelling” ability in a melody line is what makes a song reach a level of greatness. Be sure to use the techniques I’ve just discussed and you’ll create many inspirational melodies that you’re truly proud of. To learn more about how to write a melody, including techniques from beginner to very advanced, click here and discover The Songwriting Genius Within You.